I am very pleased to announce that Leopard’s Leap has concluded a major joint venture with Yangzhou Perfect Co. to dramatically increase the export of South African wine to China, one of the fastest growing wine markets in the world. The joint venture will be called Perfect Wines of South Africa and will be 51 percent owned by Yangzhou Perfect and 49 percent owned by Leopard’s Leap Wines. The joint venture will own the L’Huguenot wine brand. Three years ago my team and I identified Asia as an export destination for our wines. The growth in annual exports of South African wine from 1.2m to 4.5m litres in three years supported our decision to look east. I am proud to have concluded this deal with Perfect (China) President Mr. 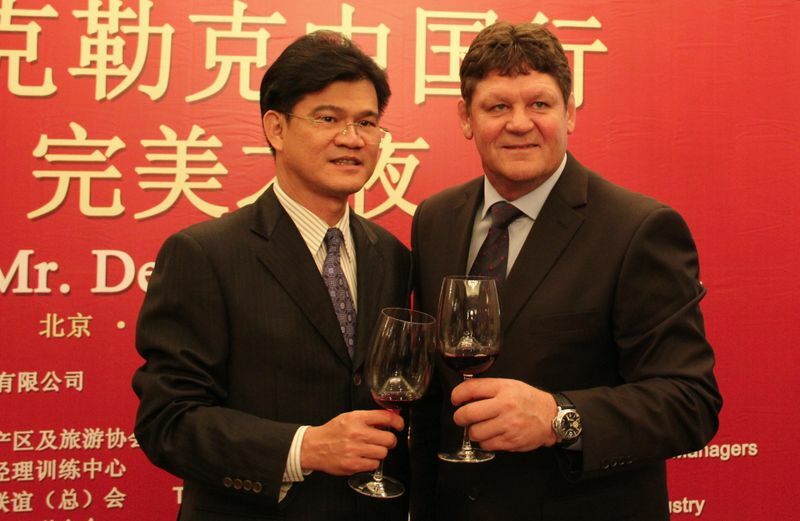 Woo Swee Lian (in the photo above with me), who also sees the potential of South African wine in China. The jointly owned L’Huguenot wine brand is named after the French Huguenots who fled to South Africa in the 17th century and settled in what is now Franschhoek.